When you pick up a project car, you are doing a lot more than just acquiring a vehicle to build – you’re embarking on a journey. And over the course of that journey you’ll often meet fellow enthusiasts who will give you advice, leads on parts, and eventually become close friends. 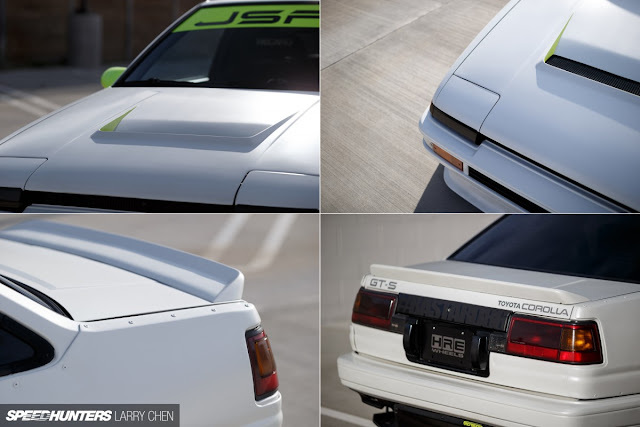 Some types of cars seem to have this community element more than others – and the Toyota AE86 has to be near the top of the list when it comes to the sheer camaraderie that surrounds the model. It’s that community feeling that Mickey Andrade, the builder of this Corolla, loves most about his 86 experience. Mickey has been around the American drift scene since its earliest days, and he was initially attracted to the AE86 after watching people like Taka Aono, John Rusakoff and Darren McNamara drive their Corollas to glory. 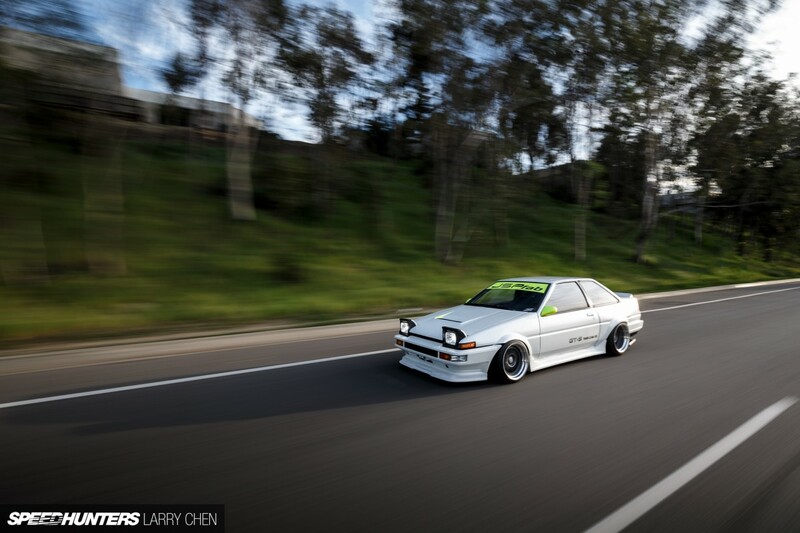 Finally in 2011, Mickey acquired an AE86 of his own – although he did it more out of a necessity than anything else. The truck he’d been driving every day was rear-ended and he needed a cheap daily to get around in while the pickup was being repaired. 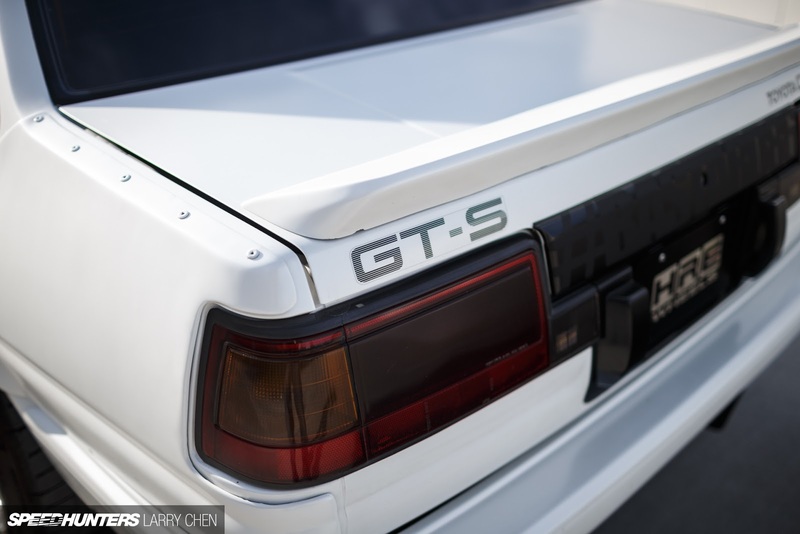 The car he bought was not the iconic Corolla GT-S, but the more basic SR5 model. Even so, the price was just 800 bucks, and considering the car’s extremely good condition, Mickey knew he’d scored a great deal on a model that’s become increasingly harder to find. 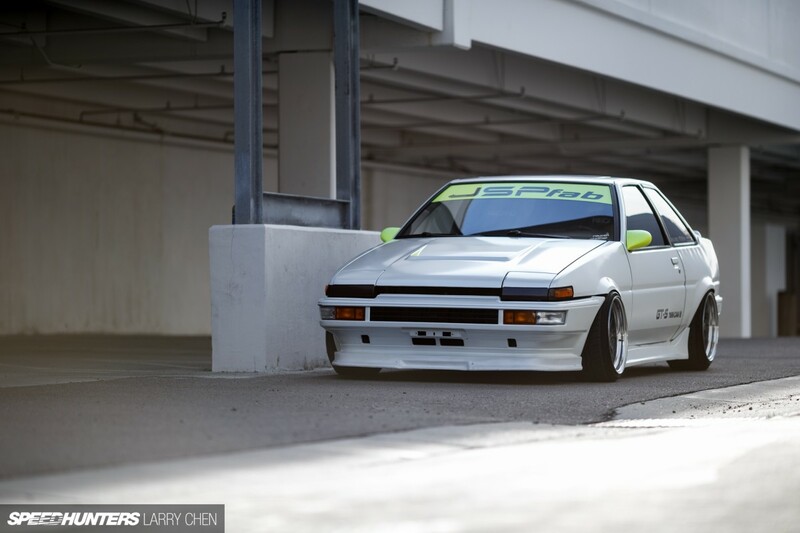 While he might have had ideas of keeping the car as a simple commuter, Mickey soon found himself moving deeper and deeper into the AE86 cult. Like many SR5 owners, he started to plan out a GT-S conversion. With the help of his friend and 86 legend Taka Aono, Mickey’s Corolla soon underwent a GT-S conversion – which included a twin cam 4A-GE motor swap, a stronger rear end, fuel tank and installation of every other part that came standard on the GT-S. Having friends like Taka and John Rusakoff certainly helped when it came to sourcing parts, as both had garages packed full of spare AE86 stuff. With the GT-S conversion complete and a twin cam heart now beating beneath the Corolla’s hood, Mickey set out for some local track days to wind the car out. While it was great fun in the corners, he still found the 86 lacking in power. As he describes it, he felt a bit like Fred Flinstone out there with the stock 1,600cc engine. He soon began thinking of ways he could get more power from the car without having to go too extreme. He could have built the 16-valve 4A-GE or retrofitted a 20-valve version, but in the end he decided to go in a completely different direction. 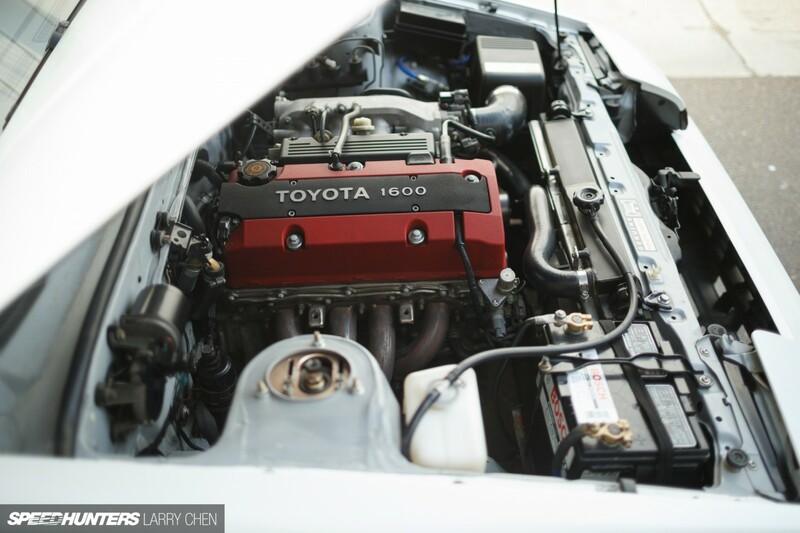 John Russakoff had a lot of experience swapping Honda F20C motors into the AE86 chassis, and he told Mickey that the S2000 swap might be just what he was looking for. Not only would the Honda engine give the 86 a significant power increase, it would do so without sacrificing reliability. Just as importantly, while the F20C came from different manufacturer, the high-winding naturally aspirated motor was similar in spirit to the original 4A-GE – only with a lot more power on tap. 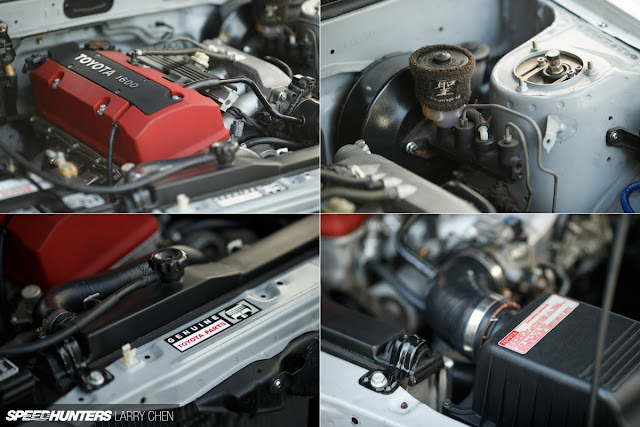 The VTEC swap was the way to go, and soon Mickey was on the hunt for a suitable donor engine. As it turned out, John came across a salvaged S2000 for sale that both he and Mickey would be able to use. John was looking for a donor chassis for a drift car build, so he and Mickey bought the car, with Mickey putting dibs on the engine, trans and wiring, while John would take the rolling shell. In 2013, Mickey rolled the Corolla into John’s shop, JSP Fab in San Diego, where the car went under the knife for its F20C conversion. Great care was taken to make sure everything looked as OEM as possible, and the only real change from the factory S2000 setup is the JSP Fab turn-down exhaust system. The motor might be stock, but what’s not to like about big power, a high redline and legendary Honda reliability? I’m not sure what the Toyota purists will think about the ‘Toyota 1600′ badging on top of the car’s Honda 2.0-liter motor – but I love it. You can’t help but smile when you see it. With the increased power that the car was making, a lot of suspension and chassis work was needed. The setup now includes adjustable coilovers in both the front and rear, JSP Fab lower control arms and a number of upgrades from the AE86 specialists at T3. The brakes meanwhile use Project Mu parts all around, and an ASD hydraulic e-brake has been added for sideways occasions. While Mickey did the swap largely because he wanted more power at track days, the car was still built primarily for street use. So rather than going the stripped-out track car route, great care was taken to make the interior and exterior as refined as possible. While Californians are blessed with a climate that makes rust almost a non-issue, one thing we do have to deal with are sunbaked interiors. 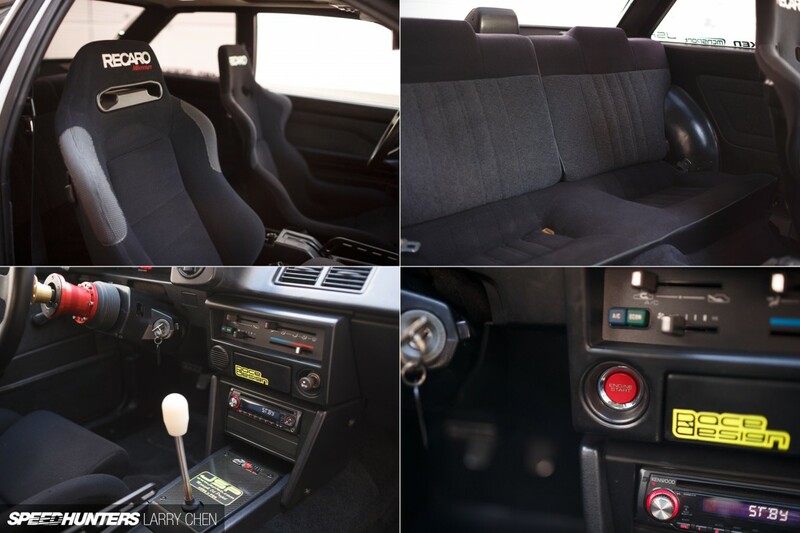 While Mickey’s Corolla was in great shape for its age, the trim had seen better days, so he got in touch with Canadian AE86 enthusiast Pat Cyr who just happened to come across an absolutely mint Canadian-spec GT-S interior. Pat put all the interior pieces on a pallet and shipped it to California, and despite the fact that customs fees ended up being much more than Mickey anticipated, the interior renovation with its uncracked black dashboard made a huge difference – especially when combined with other additions like the Recaro seats and Sparco Champion steering wheel. As for the exterior, Mickey slowly evolved the car’s look over the years, eventually settling on a style that combines original JDM parts and a number of aftermarket components. De-textured JDM bumpers can be found in both the front and rear, along with Shine Auto sideskirts and a MCNSport rear diffuser. You’ll also notice the D-Max wide fenders, which add the right amount of attitude without detracting from the iconic look that drew Mickey to the AE86 coupe in the first place. And to set everything off, the whole car was treated to a few coats of Lexus Starfire White Pearl with a satin clear finish by Creations ‘n Chrome. There aren’t a whole lot of AE86s out there running around on HRE wheels, but the custom-built C103s on this car manage to look both unique and natural at the same time. They measure 16×9-inch in the front and 16×10.5-inch in the rear with Falken Azenis tires all around. For as satisfying as Mickey’s experience building and driving this Corolla was, you might be surprised to hear that he recently sold the car. 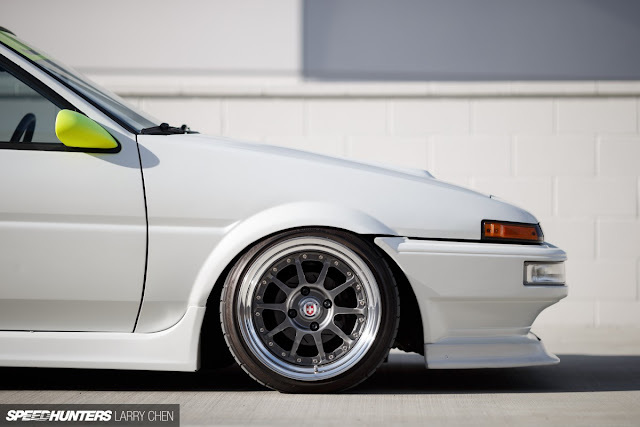 Recently he hasn’t had a whole lot of time to drive it, and with a few other projects on the go he decided the Corolla was better off in the hands of someone who could enjoy to its fullest. While Mickey says he’s considering buying a pre-1975 project car next so he can avoid California’s tough smog laws, he says he’ll never forget what it was like be part of the AE86 community. 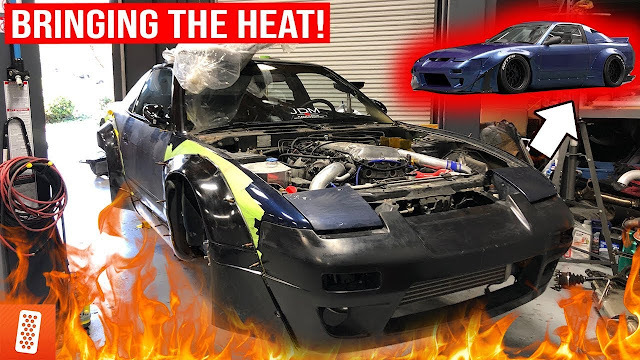 He hasn’t ruled out buying another 86 in the future either, and he even told the new owner to let him know first should he ever decide to sell it. I guess great cars just have a way of doing that to you.